Just a quick question When did the journalists become the experts? I thought that the experts were the ones that were usually the information source for the television and print stories regarding the market. I know I have asked about this before, but this morning it really struck name when on CNBC, (the financial mavens‘ network) there was a roundtable concerning the market lead by Becky Quick, a CNBC reporter. The three people she was interviewing were all media/press representatives. One was a writer for thestreet.com, one from Fortune Magazine and another from the Financial Times. While they are very close to the market action and all very smart, one has to ponder when and why the reporters have become the “newsmakers”. Maybe the change occurred when the markets became invincible some time around 2006 and everyone became an expert – no matter how much they really know or not. But the real concern is the continual bullishness by some of the reporters. It seems that they have become part of the volatility rather than simply reporting on it. What is next? Maybe the delivery people will be interviewed. Maybe the cameramen and the radio diskjocky’s will be giving us advice. Maybe even webmasters will have a position they should share. I cannot wait! I cannot help to think about the stories about two very famous gents. One is Joe Kennedy, a rather famous and very rich fella who decided to sell his positions in stocks after a shoeshine boy gave him a few stock tips. 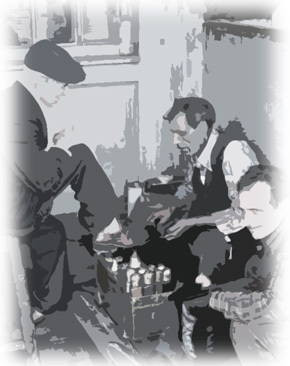 He thought that when the shoeshine boys have tips, the market is probably too popular for its own good. I hope that when I get my dry cleaning today, we only talk about spots and starch rather than stocks and charts.